A local Worcestershire company which specialises in manufacturing upholstery has been awarded a grant to install a biomass CHP system. The business’ priority for energy demand is natural gas and heating oil used for heating. After the business had registered for the support available through the Low Carbon Opportunities Programme, consultants Carbon Smart organised a site visit to review the buildings, energy demand and opportunities for installation of renewable energy systems. Carbon Smart found that the business produces significant quantities of waste wood per year through the manufacturing process. This waste wood is currently sent to landfill, incurring disposal costs. The business was therefore interested in reducing both the heating costs and landfill disposal fees by installing a biomass fuelled heating system using their waste wood. It was recommended that the business installs a biomass combined heat and power (CHP) system. CHP is a technology which generates electricity and captures the waste heat generated during that process. Electricity can be generated using gas, or a renewable fuel source, such as biomass. By using waste heat, CHP systems can reach efficiency ratings in excess of 80% (in the UK, gas power stations have efficiencies of around 50%). As the power is being produced from the fuel source on site, rather than at a power station, you also avoid losing electricity during the transmission process of the electricity being distributed around the grid. We were keen to look at how we could generate our own energy and reduce our expenditure on energy bills, which have been increasing year on year. 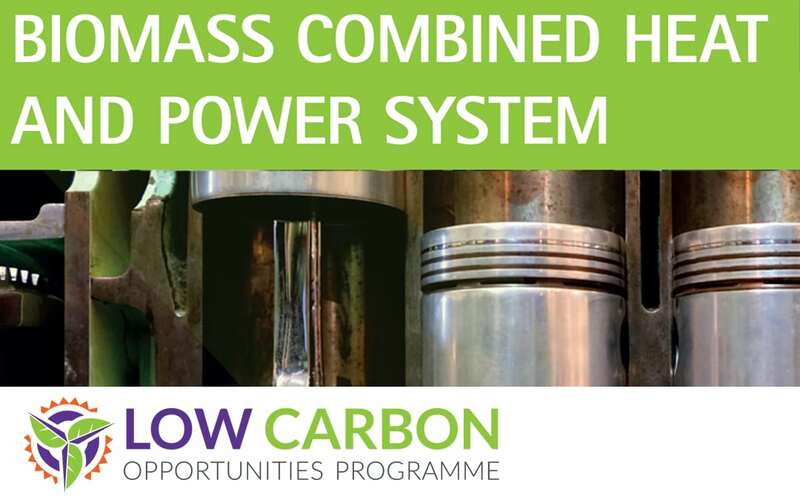 Receiving the free support from the Low Carbon Opportunities Programme was a good opportunity to look at all the options available to us. Once we had decided to opt for the biomass CHP system, we were supported to put in the grant application and were pleased to hear a few weeks later that the grant had been approved. To use waste wood in a CHP system, a pellet mill also needs to be purchased. Fortunately, the business has enough space for the pellet mill, as well as to store the waste wood to be used as fuel and the CHP unit itself. The system will substantially reduce the energy and wood disposal costs currently incurred by the business and will lead to a large reduction in carbon emissions. The system will also provide 93% of the business’s electricity demand from September to April, and 100% of their heat requirements all year round. Information on combined heat and power from the Association of Decentralised Energy.